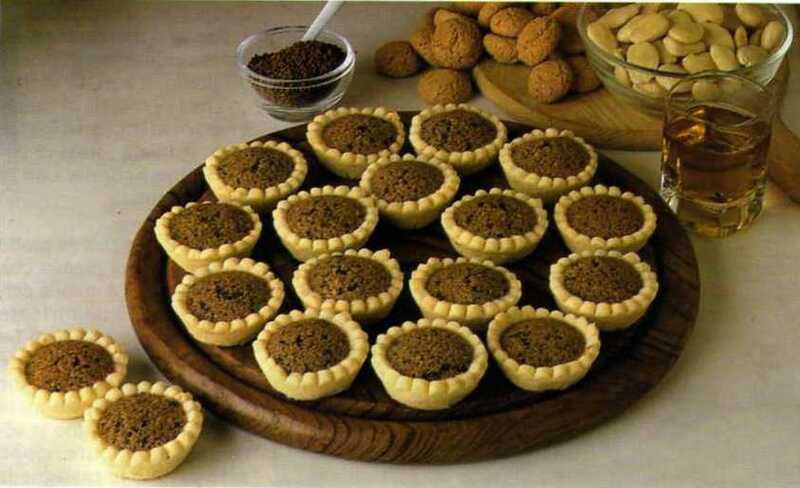 Serves: 12 Difficulty tarts': Easy Preparation time: 50 minutes + 2 hours in the refrigerator Ingredients for the pastry 150g. flour 75gr. 50g of butter. sugar 1 pinch of salt For the filling 60g. butter 2 tablespoons sugar 1 egg 60g. 2 amaretti almond 1 tablespoon of coffee 'soluble 1 tablespoon plus 1 / 2 cornstarch 2 tablespoons amaretto liqueur 3 drops of almond essence ---------------- ---------- PROCEDURE Prepare the pastry by mixing the ingredients quickly and work the dough with your hands until the work plan 'is smooth and homogeneous. Modeled after having a ball, wrap in a sheet of plastic wrap and let rest for 2 hours in refrigerator. After this time, roll out the dough with a rolling pin, line 12 cutters 4cm. in diameter each, and trimmed the dough with scissors. Prick bottom of dough with a fork so that swells during cooking. Meanwhile prepare the stuffing, work the whipped butter with sugar. United 1 egg, beat vigorously and slowly add the cornstarch, almonds, peeled and chopped, crushed amaretti biscuits, coffee 'soluble, and alcohol and the drops of almond essence. Mix everything again, then break down the mixture into the molds lined with pastry and bake in preheated oven at 170 degrees for 30 minutes. Make sure the pasta is cooked to perfection before Gently unmold tarts. Let them cool thoroughly before serving.